According to planetary scientists, ‘hothouse earth’ is an encroaching and deadly concept – even if the reductions in carbon emissions called for in the Paris Agreement are reached, the earth’s climate may keel on to an irreversible pathway of increasing temperatures and rising sea levels in as soon as 50 years (McGrath, 2018; Steffen et al., 2018). It is the notion of a ‘hothouse earth’ I wish to explore in this essay, based upon observations and subsequent research of places I visited whilst on vacation in the West coast of Canada and the US. 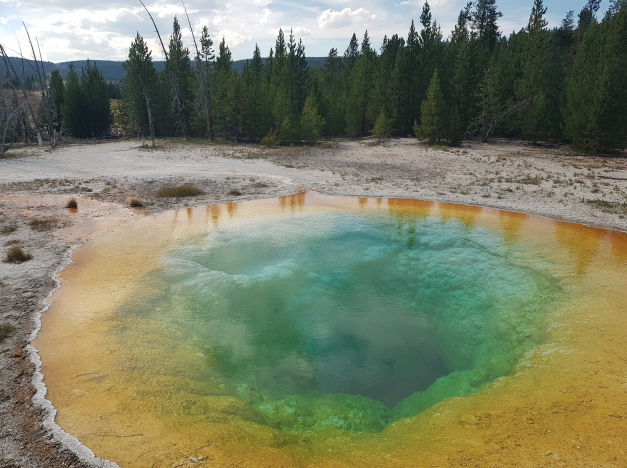 I travelled down through the Rocky Mountains and ended up in Yellowstone park, an ecosystem not only saturated with geothermal activity but indicative of how nature is coping with changing patterns of anthropogenic activity and climatic variables. The aforementioned landscapes offer an insight into the likelihood of a ‘hothouse earth’ scenario unfolding in the future, which this report seeks to explore. The above image (Figure 1) is one that I took of the Athabasca glacier, which perhaps does not seem to fulfil expectations of a vast, white, iridescent volume of ice that is typically synonymous with the word ‘glacier’. 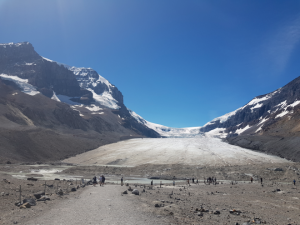 An information board by the glacier notified tourists that in the past 125 years, the Athabasca glacier has lost half of its volume and receded by more than 1.5km, with about 0.3km of the snout’s retreat occurring in the last 20 years. In addition to these startling figures, a subsequent board highlighted the dangers of straying from the marked path via the story of a 9 year old boy who had been hiking on the toe of the Columbia Icefield in 2001 when a snow bridge which he stepped on gave way, sending him falling into the crevasse below. By the time the rescue crew managed to pull him out 4 hours later, his body had already succumbed to hypothermia. An incident like this tends to happen at least once a year, demonstrating the fragile nature of a glacier that appears to be receding exponentially in an irreversible fashion – thus corroborating the notion of a ‘hothouse earth’. Figure 2: Bow Lake in 1902. 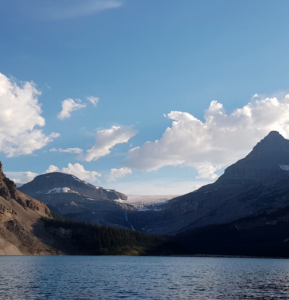 The next stop on our road-trip, Lake Louise and its proximal glaciers, alluded to similar observations; that glaciers in the Rockies are undoubtedly receding. It appears that this recession is natural, but “augmented by the man-made effects” (Osborn cited in Walton, 2009), leading to such glaciers declining at an increasingly rapid rate. This poses an alarming problem for regions of Western Canada that depend upon glacial water for their homes, businesses and agricultural sector (ibid). Indeed, Bow Glacier, approximately 37km northwest of Lake Louise, is a prime example of glacial retreat, as documented by the Vaux family in black and white photographs over many decades. Figure 3: Bow Lake in 2002. 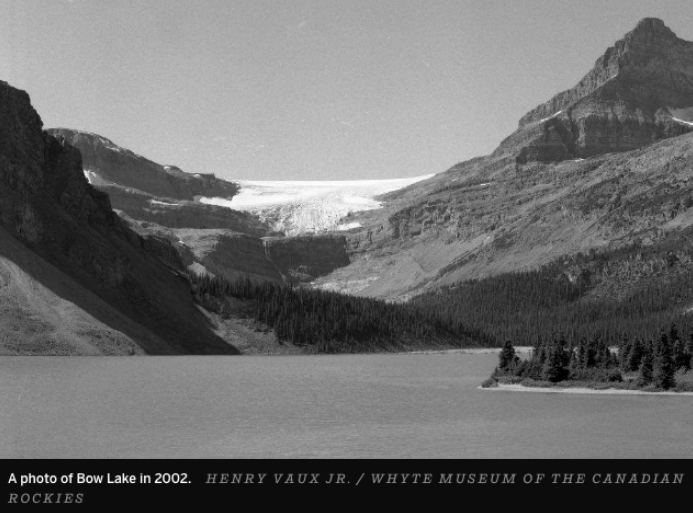 Henry Vaux Jr travelled to the Canadian Rockies every August from 1997 to 2013 to replicate images taken by his ancestors a century earlier, providing astounding visual evidence of Bow Glacier’s recession (Derworiz, 2015). 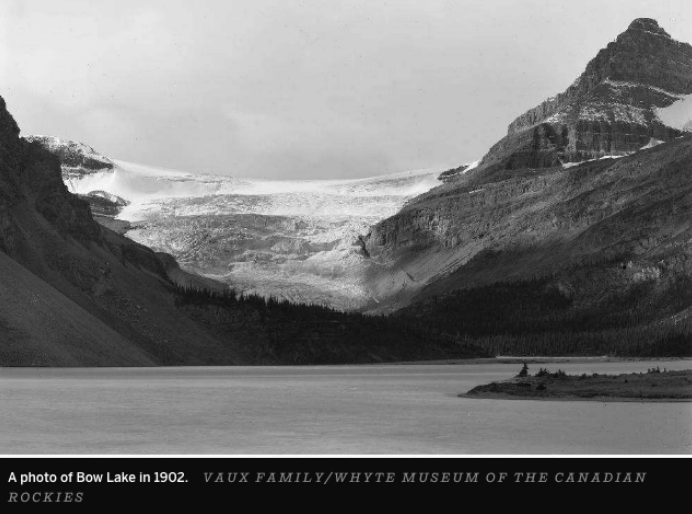 Figure 2 was taken by the Vaux family in 1902, picturing Bow Lake and its glacier in the background. Taken exactly 100 years later, Figure 3 shows Bow Lake from the same vantage point, depicting the vast extent to which the glacier has retreated. This is substantiated by the photograph I took this summer (Figure 4), showing that the trend in retreat of Bow Glacier shows no signs of decelerating – perhaps suggesting that a ‘hothouse earth’ scenario is imminent. Figure 4: Bow Lake in 2018. The effects of changing environmental variables on Yellowstone National Park, our last stop, were also evident. According to scientists who have been monitoring Yellowstone’s climate for decades, average temperatures are higher than they were 50 years go whilst spring precipitation levels are decreasing, which will likely affect the constitution of plants and animals in the park as well as increasing the frequency and length of fires (Whitlock et al., 2007; Balling et al., 1992). An example of both factors at play regards white bark pine trees and mountain pine beetles. In recent years, a higher incidence of forest fires has diminished the abundance of white bark pines, a foundation species due to its role in enhancing soil formation alongside “providing the major biomass and primary productivity” (Logan et al., 2010 p896) of high mountain and alpine ecosystems. Simultaneously, higher seasonal temperatures have allowed the mountain pine beetle to invade new niche space including white bark pine forests, thus disrupting the wider ecosystem and providing evidence that the effects of climate change work across a range of scales – from global sea level change to regional community composition change. 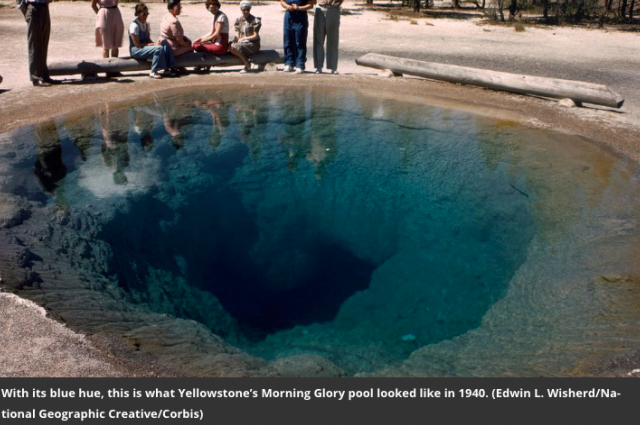 I would like to conclude by utilising one last example – that of the Morning Glory pool in Yellowstone. Figure 5 is an image of the pool taken in 1940, the tropical blue hues of which seem non-existent amongst the warm yellow/oranges tones in Figure 6, the photo I took during our visit. The change in the colour of the water can, sadly, be solely attributed to visitors throwing pennies, rocks and other objects into Morning Glory. Researchers have discovered that these objects have occluded parts of the heat source and caused the pool’s temperature to lower, enabling microorganisms that thrive in lower temperatures to inhabit the pool (Clark, 2015). Such microorganisms produce pigments that have turned the pool yellow, green and orange over time. Could this example be labelled a micro-scale metaphor for human-induced global warming? It demonstrates how the actions of humans can alter ecological compositions through temperature change and therefore change the appearance of a landform itself. This process, on a macro scale, exemplifies how a ‘hothouse earth’ scenario seems unavoidable on our current trajectory. Beyond the threat of millennials and Gen X having to pay the ‘climate change bill’, a ‘hothouse earth’ sequence of events is becoming more realistic with each day that we fail to address the gravity of the situation, accentuating the need to alter our lifestyles if there is to be any hope of minimising or evading this potentially devastating future. Balling, R., Meyer, G. and Wells, S. (1992). Climate change in Yellowstone National Park: Is the drought-related risk of wildfires increasing?. Climatic Change, [online] 22(1), pp.35-45. Available at: https://link.springer.com/article/10.1007/BF00143342 [Accessed 26 Aug. 2018]. Clark, L. (2015). Tourist Trash Has Changed the Color of Yellowstone’s Morning Glory Pool. [online] Smithsonian Magazine. 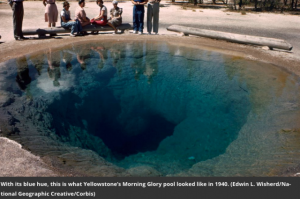 Available at: https://www.smithsonianmag.com/smart-news/touristtrash-has-changed-color-yellowstones-morning-glory-pool-180954239/ [Accessed 26 Aug. 2018]. Derworiz, C. (2015). Decline of glaciers in Western Canada chronicled in family photographs. [online] Calgary Herald. Available at: https://calgaryherald.com/news/local-news/going-back-intime-to-record-retreat-of-glaciers [Accessed 26 Aug. 2018]. Logan, J., Mcfarlane, W. and Willcox, L. (2010). Whitebark pine vulnerability to climate change induced mountain pine beetle disturbance in the Greater Yellowstone Ecosystem. Ecological Applications, [online] 20(4). Available at: https://esajournals.onlinelibrary.wiley.com/doi/ 10.1890/09-0655.1 [Accessed 26 Aug. 2018]. McGrath, M. (2018). Climate change: ‘Hothouse Earth’ risks even if CO2 emissions slashed. [online] BBC. Available at: https://www.bbc.co.uk/news/science-environment-45084144 [Accessed 26 Aug. 2018]. Steffen, W., Rockström, J., Richardson, K., Lenton, T.M., Folke, C., Liverman, D., Summerhayes, C.P., Barnosky, A.D, Cornell, S.E., Crucifix, M., Donges, J.F., Fetzer, I., Lade, S.J., Scheffer, M., Winkelmann, R., and Schellnhuber, H.J. (2018) Trajectories of the Earth System in the Anthropocene. Proceedings of the National Academy of Sciences (USA). Available at: http:// www.pnas.org/content/early/2018/07/31/1810141115 [Accessed 26 Aug. 2018]. Walton, D. (2009). The mystery of Lake Louise’s missing water. [online] The Globe and Mail. Available at: https://www.theglobeandmail.com/news/national/the-mystery-of-lake-louises-missingwater/article4216178/ [Accessed 26 Aug. 2018]. Whitlock, C. et al,. (2007). A 2650-year-long record of environmental change from northern Yellowstone National Park based on a comparison of multiple proxy data. University of Nebraska, Lincoln. Available at http://digitalcommons.unl.edu/cgi/viewcontent.cgi? article=1001&context=geosciencefacpub. 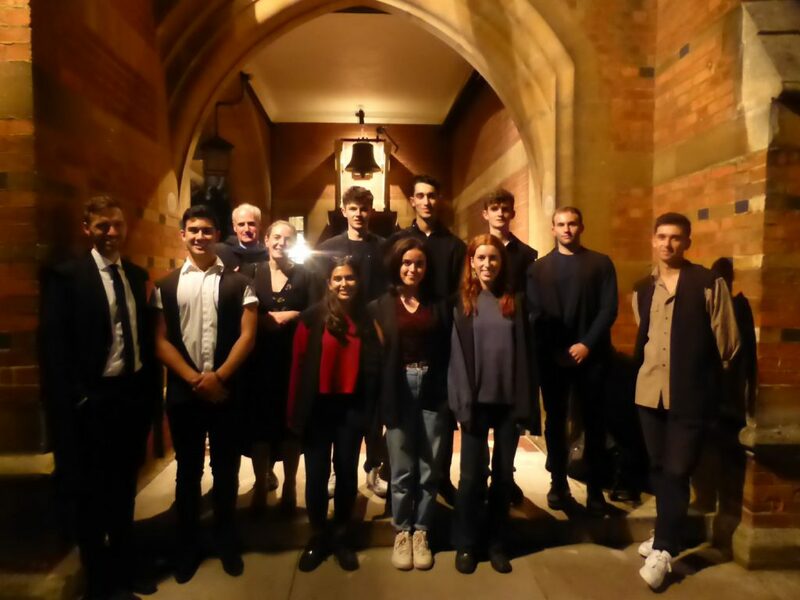 Each year in December the College hosts the Founders’ and Benefactors’ Feast to which the most recent graduates who gained Firsts in their subjects are invited. This year the event took place in the Bodleian Library’s Divinity School – a spectacular setting for a wonderful evening. 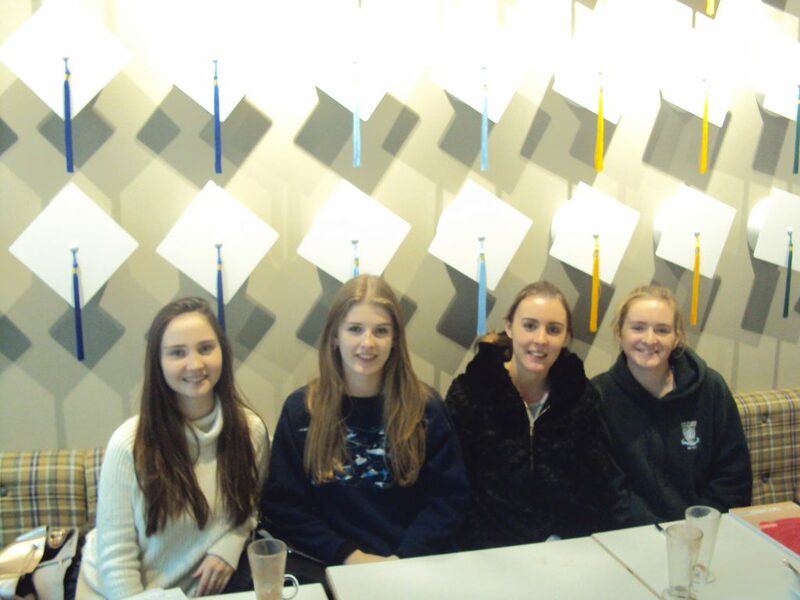 Beth and Fiona were pleased to welcome back Alessandra, Caitlin, Natalie, Sofia and Rakan. As a large proportion of my vacation was filled by rowing training I decided to investigate the experiences through a geographical lens. Inspired by Spinney’s (2006) kinaesthetic ethnography of Mont Ventoux, I decided to explore the ways in which landscape is constituted through phenomenological experiences when rowing. This study took place over the course of a month on the River Thames as it flows through Wallingford, and I was particularly interested to see the extent to which the experiences of landscape changed temporally. The work of R’Kiouak et al. (2018) suggests that through intensive team training there is a shift from inter-personal to extra-personal modes of regulating joint action. Essentially this means that there is a change from focusing on other participants to regulate movement, to a focus upon external factors (the environment) to regulate the same movement. In practice, this means observing the movement of the boat (symmetry, balance, velocity) and responding to this feedback to synchronise movement through the boat. Interestingly, despite the short period over which my research was carried out there was a noticeable shift in my experiences. The first two weeks were dominated by following/ copying other actors, this focus other women influenced the way in which I experienced the landscape. Whilst I was absorbed in back and shoulders of the woman in front of me, watching intensely and trying to mimic their actions exactly, I did not see the wider landscape. Similarly, during this period I was listening to the sounds and rhythms created by the movement of others in the boat (the sound of the seat rolling, the clunk of the oar in the oar lock, the splash as the blade enters the water) in order to synchronise my movement and propel the boat. This absorption in the actions of others impacted my perception of the landscape as my senses were focused somewhat narrowly. Thus, following several weeks of intensive training there was a perceptible shift in my experience of the landscape. Driven by a reduced need to focus on those around me for synchronicity, my senses provided information from a broader range of sources. This increase in breadth was not linked to a decrease in intensity, and the sensory experience of rowing was similarly intense. However, I saw beyond the person ahead and down the line of the boat, at the often six women ahead of me. I also saw outside the boat, and could see the line of the horizon, the trees with leaves of varying shades moving away from me, the puddles left by the oars sinking into the river, and ripples in the water spreading from the boat. The sounds became of water rushing past the boat, of lurching when the boat became unstable, and sometimes of birds singing, or people talking or engines of road traffic passing overhead. I became more aware of the smells of the river, often fumes but also of farms, of cooking in restaurants, and the food of fishermen. I became less aware of the feeling of the blade in my hand, and the movements felt increasingly natural. This is an interesting example of the hybrid body-subject that Spinney (2006) refers to in his work. Whilst he refers to human and bicycle as becoming one with repeated use, a similar connection appears to occur between human and oar. 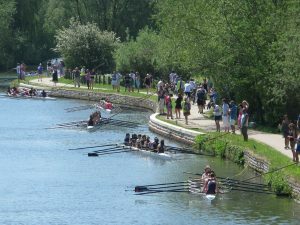 The connection between human and environment is mediated by the technology of the oar, and over time this interdependence is developed through use. Having said this, and highlighted the key shifts in phenomenological experience over the course of a month, it is important to note that these experiences are by no means entirely representative. Whilst there is a general trend that sees a shift from inter-personal to extra-personal regulation, these experiences can and do vary greatly from day to day and also within days, from session to session. Weather can influence feeling greatly, with a notable session on 29th October shaped significantly by the heavy rain and strong winds felt in Wallingford and the subsequent feelings of my body shivering, wind and rain swiping at my back, water dripping down the back of my neck, and gripping onto a wet handle. In this case, my experience of the landscape was limited almost entirely to my own body and to the boat close to me. I was aware of the sounds of the boat but of very little beyond this (perhaps only the sound of a coach’s voice through a megaphone), and I cannot recall smelling anything, despite the presence of (I am certain) significant variation in aromas. This is indicative of the varying nature of the experience of landscapes, regardless of training. Thus, it may be tentatively concluded that the experience of landscape is constructed jointly by the actions of an individual within them and the contexts in which these actions occur. 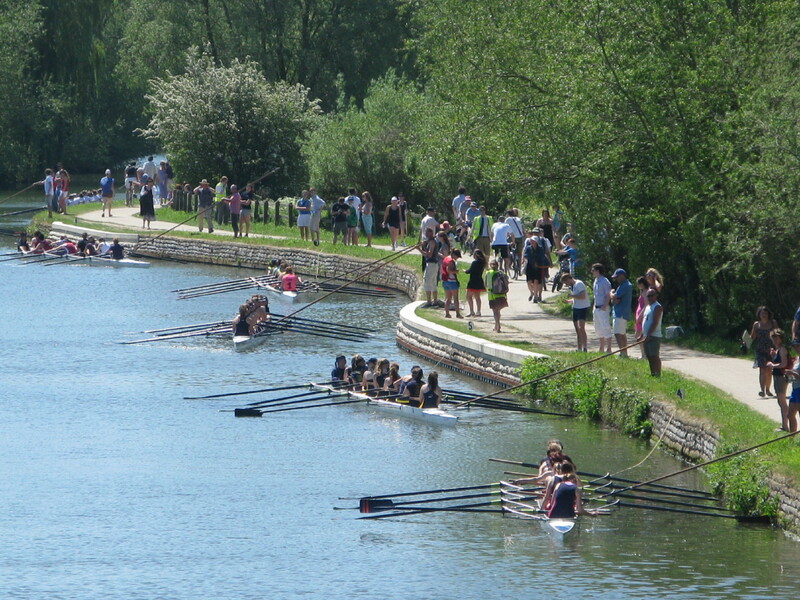 Whilst there is a general trend to a wider experience of landscape with training, there is frequent variability and each session builds upon the construction of meaning (through experience) of the landscape of the River Thames in Wallingford. R’Kiouak, M., Saury, J., Durand, M., Bourbousson, J., 2018. Joint action in an elite rowing pair crew after intensive team training: The reinforcement of extra-personal processes. Hum. Mov. Sci. 57, 303–313. Spinney, J., 2006. A Place of Sense: A Kinaesthetic Ethnography of Cyclists on Mont Ventoux 24, 709–732. A significant proportion of my summer holiday was spent working on my family’s farm in the Dartmoor National Park, Devon. We rear livestock, primarily cattle for beef which are sold at between nine months and twenty four months of age at market before going on to be fattened and sent to slaughter. On the 27th September we had our six-monthly bovine Tb test where we had one cow from a herd of over one hundred test positive for the disease. This means that we are unable to sell, or move off farm, any livestock until two clear tests are achieved. This has multiple effects, the first being that there is a significant interruption to the cash flow of the business as the autumn is a time at which we would tend to sell a large proportion of the young stock we were not keeping for breeding. Secondly it creates the issue of having to house and feed many more livestock through the winter months than planned. 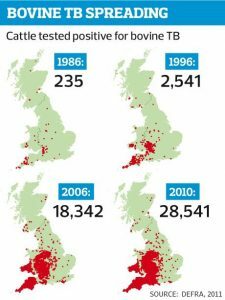 The culling of badgers is one of the main ways in which the government has aimed to stop the spread of bovine Tb and having narrowly missed out on being in a cull zone recently I was interested to look more into how cull zones are set up and how this form of tuberculosis has spread in UK livestock. Bovine Tuberculosis is an infectious disease which can infect many mammals. Over the last half century is has spread significantly across the UK (see Figure 1 below). This has caused significant problems and therefore mainly due to the cost to the economy (over £100 million/year (TB Free England, 2013)) that major work was needed to try and reduce the prevalence of this disease. The spread of this disease is interesting because it shows the interaction between human-driven farming and the natural environment. With wild animals including badgers and deer being blamed as the main carriers of the disease it exemplifies a key tension between farmers and nature. This is mainly due to the fact that in areas of no infection in the surrounding wildlife, bovine tuberculosis outbreaks are shown to be short and easily managed (TB Free England, 2013), however when there is a reservoir of the disease in the natural environment controlling the spread is much more difficult. Therefore due to the increasing cost of the disease it was decided that further action needed to be taken. Due to the link between badgers and the disease cull zones we set up to significantly reduce the number of badgers. The cull zones are concentrated in the high risk areas (Figure 2 and Figure 3 below). In terms of geographical focus it is most interesting to try and determine how the cull zones were set up as they appear to have somewhat arbitrary borders. There are a number of criteria which must be fulfilled in order to set up a cull zone: areas must be at least 150km squared, with 70% of the proposed land accessible for culling and a large degree of the inaccessible land near to accessible land. There is also a four year financial commitment (Badger Action News, 2018). To a large degree the criteria for setting up cull zones are difficult to achieve that this may limit the effectiveness overall due to the inability to destroy the disease reservoir in the natural environments outside of the cull zones. The argument of whether and how to set up cull zones is largely affected by the need to balance political and scientific factors and often political factors take precedent in contentious situations (Nature Publishing Group, 2007). Figure 2: Relative Risk of Tb Outbreaks Areas (TBHub, 2015). Overall it has been relatively difficult to obtain unbiased information on the contentious issue of the use of culling badger and also on how the cull zones are set up. The latter is to a large degree down to the need for information over the cull to remain relatively secretive to protect farmers and landowners from campaigners. 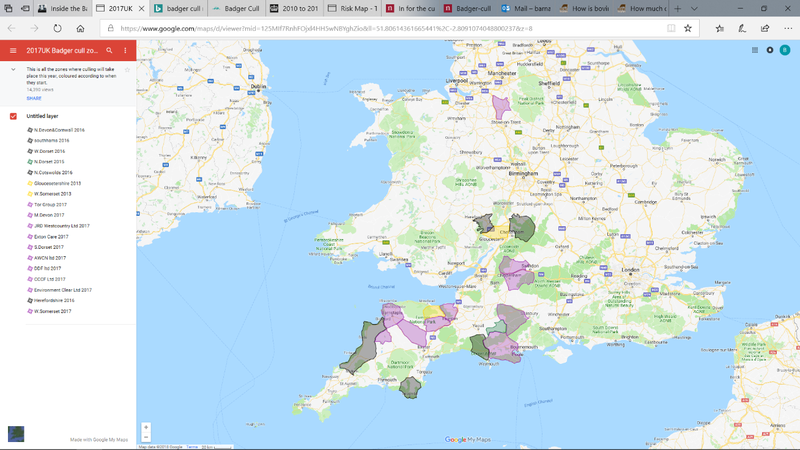 The south west of the country has traditionally and still is the worst affected area by this disease and this is reflected in the number of cull zones in the region. The creation of cull areas though does appear to be more based upon ease of access rather than the likelihood of helping to achieve the long term aim of eradicating BTb, a wider still approach to wildlife management may be need for this. The most interesting geographical takeaways have been to see the need to balance economy with the environment, relating to the spread of tb, and balance between political aims and science in deciding how best to move forward with eradicating the disease. 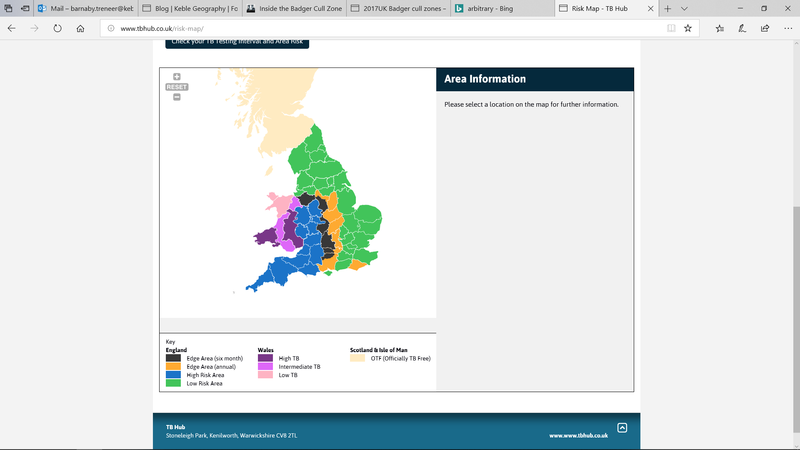 Figure 3: Badger Cull Zones in the UK 2017. Badger Action News (2018) Inside the Cull Zones. Badger Action News. Available at: http://badgeractionnews.org/the-cull/inside-the-badger-cull-zones/ [Accessed on: 30/09/2018]. Nature Publishing Group (2007) In for the cull. Nature. Vol 450. Issue no. 7166 published on 1/11/2007. Available at: https://www.nature.com/articles/450001b.pdf [Accessed on: 30/09/2018]. NFU IT (2013) How Much Does bTb cost? TB Free England. Available at: http://www.tbfreeengland.co.uk/faqs/how-much-does-btb-cost/ [Accessed: 30/09/2018]. TBHub (2015) Risk Map for Great Britain. TBHub. Available at: http://www.tbhub.co.uk/risk-map/ [Accessed: 30/09/2018]. 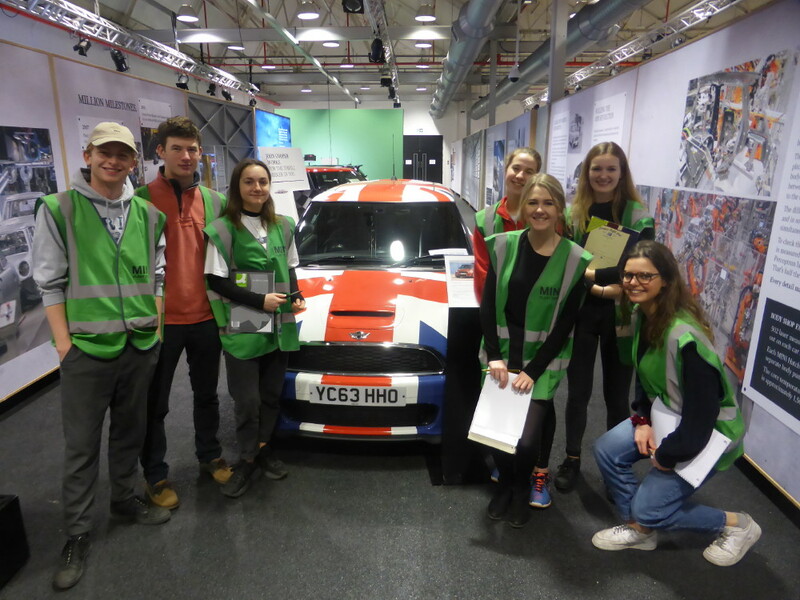 Over the summer I was visited by a family who are participating in Malta’s “Citizenship by Investment” programme that aims to provide Maltese citizenship, and therefore access to the European Union and the Schengen Area, to those who are considered financially eligible (Malta Immigration, 2018). In order to be eligible for the programme applicants must be able to contribute €65,000 upfront along with investing similar values into real estate and bonds. However, this is the lowest contribution required – if the applicant is married or has dependent family members further contributions are necessary (ibid). This report will examine the reasons that both the Maltese government and aspiring citizens were eager for this scheme to be available, as well as the negative consequences of the programme as perceived by the EU. 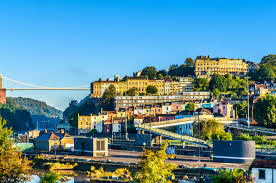 Furthermore, it will explore how the option for high and ultra-high net worth individuals to gain EU citizenship reflects an ease of transmigration for more “elite” migrants (Beaverstock, 2005). Malta is a small archipelago consisting of three islands off the southern coast of Europe, sustaining 400,000 people (Malta Tourism Authority, 2018). Upon joining the EU in May 2004, the significance of being a citizen of Malta increased as Maltese citizens were able to access 182 countries without a visa, making it the 7th most desirable passport in the world (Visa Restrictions Index, 2018). 10 years after joining the EU, the Citizenship by Investment programme was officially functioning and has provided approximately €162.5 million (Chetcuti, 2018) through investment alone (this is assuming each of the 1000 applicants provides only the minimum of €65,000). 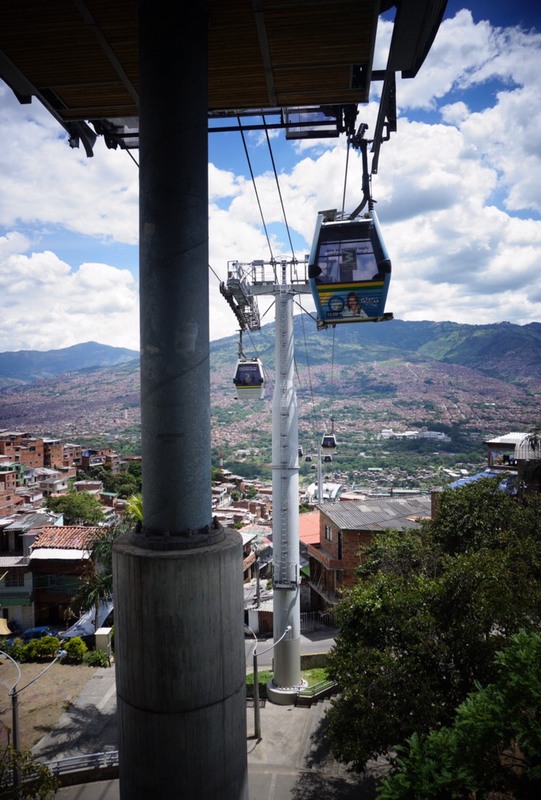 To an economy that is largely reliant on tourism, a shipment refuelling trade that is diminishing due to increasingly longer range ships, and industry centred around electronics and textile, the extra capital generated from the programme is vital for sustaining high quality of life and maintaining its status among 32 other countries as an “advanced economy” (IMF, 2018). Clearly providing economic advantages to the country, the programme continues to be considered successful by the Maltese government as they retain control over the acceptance of applicants, allowing the rejection of any persons considered to pose a potential threat to the economy or security of Malta; the government asks for 4 different types of data to ensure a clear criminal record as well as medical records to be certain that individuals will not be a drain on resources (Malta Immigration, 2018). The benefits to those applicants with sufficient funds to make the program feasible are obvious; EU citizenship to allow the right of establishment in any of the 28 EU countries, the opportunity to relocate business affairs to an EU country, and Visa-free access to 182 countries and states. 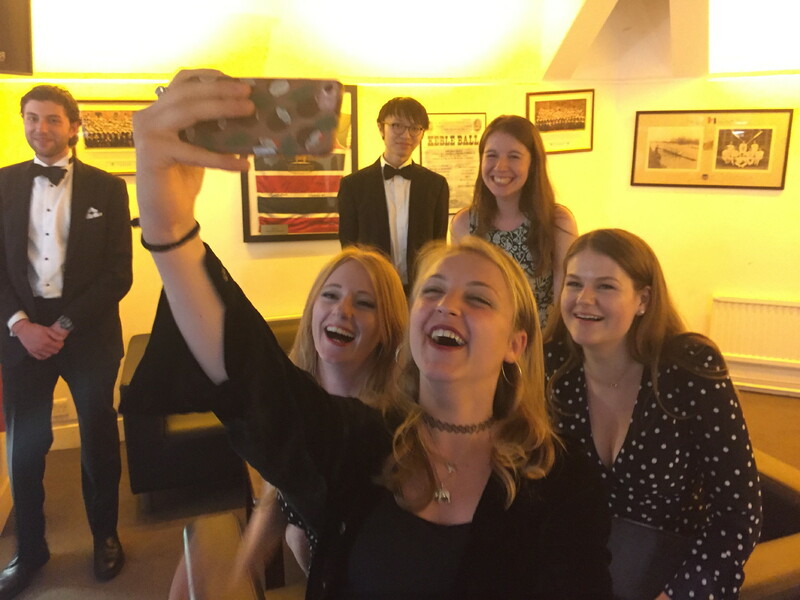 The rights to study, live and work in the EU are also passed down to all future generations of the families which is cited as a major incentive by many of the programme’s participants (ibid). While citizenship can be taken at face value and defined as simply a legal, political and social status which provides rights such as voting, freedom and welfare within a certain community (Clarke, 1993), it has previously been a concept produced by partaking in social practices and in the day to day exchange of commodities that sustains communities (Mansvelt, 2008). In today’s society the term citizenship often takes both of these definitions, implying at least some social integration into a community; in the UK applicants have to take and pass a citizenship test that includes knowledge on the country’s history and traditions (Zile, 2016, cited in Cooper, 2016). 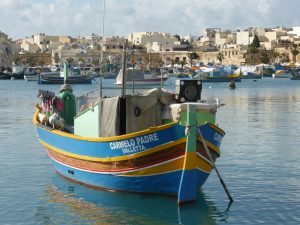 In the citizenship by investment programme, however, integration is by no means required and the Malta Immigration website even states that there are advisors on the scheme that are trained in “assisting non-English speaking clients” (Malta Immigration, 2018). In this case, it is clear that citizenship is taken to include simply the legal implications of the definition and no integration into the country and overall community is necessary. This is claimed to be potentially damaging to the transnational space that the EU has attempted to create as the immigrants are unlikely to have any real connection to the communities they live in. Critics of the programme suggest that the scheme could pose some security threats to both Malta and the EU as it can and has been used (particularly by Russians) simply to bypass sanctions imposed on certain countries. Furthermore, some argue that the scheme undermines the concept of European citizenship (Cooper, 2016). However, contrary to this, it may be argued that the EU does not provide a truly transnational space as the majority of its citizens continue to align themselves primarily with their nation-states and, while borders may be frequently crossed, social bridges are not usually created (Struver, 2005). Furthermore, the scheme highlights an already apparent trend in transnational movement whereby elite or highly skilled workers face far fewer barriers, and often much more encouragement, when migrating globally (Beaverstock, 2002). 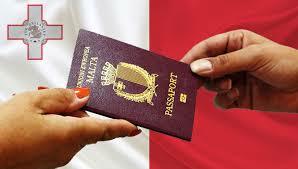 By allowing people to essentially buy citizenship, Malta is ultimately encouraging this divide as the opportunity for citizenship is only available to those with enough money. Along with much of the increased movement of the wealthy elite, Maltese citizenship brings into question how transnational these people actually are. 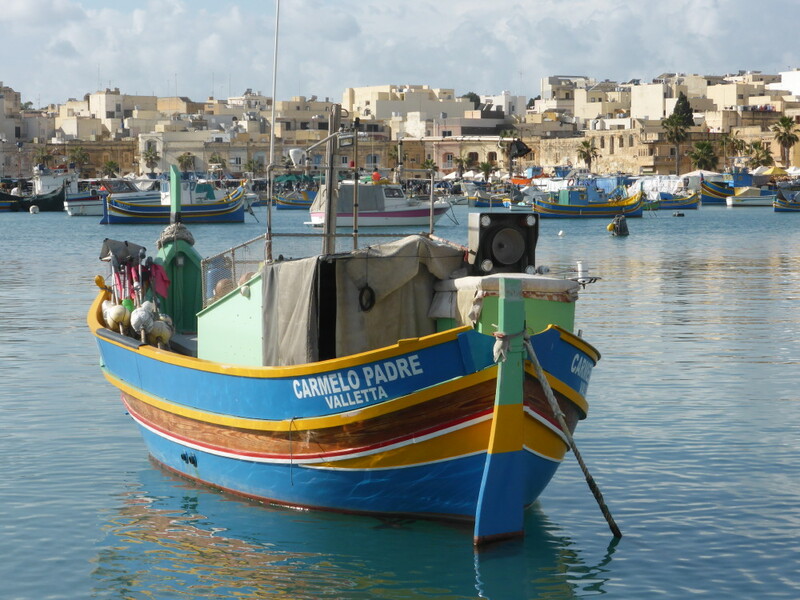 By defining transnationalism as living “stretched across borders” including “multi-stranded social relations” (Basch et al, 1994), it is difficult to view those who achieve citizenship through investment as truly transnational; there tend to be few links between a place of origin and settlement as scarcely any applicants actually live for any significant period of time in Malta and there tend to be no emotional ties created (Cooper, 2016). In conclusion, the “Citizenship by Investment” scheme in Malta is mutually beneficial for the government and successful applicants as it provides the former with increased income with minimal effort, and the latter with full use of the resources of the EU and access to numerous other countries. However, the programme is criticised for its lack of integration efforts and brings into question the transnational status of the migrants and the suitability of giving them the status of an EU and Maltese citizen. However, Austria also provides a Citizenship by Investment programme (with access to 184 countries visa-free) meaning that criticism is highly unlikely to cause any cancellation of the programmes (Visa Restrictions Index, 2018). Beaverstock, J. V. (2005) Transnational elites in the city: British highly-skilled inter-company transferees in New York city’s financial district. Journal of Ethnic and Migration Studies, 31, 245-268. Clarke, p. (ed. ), 1993. Citizenship: A Reader. Strüver, A. (2005) Spheres of transnationalism within the European Union: on open doors, thresholds and drawbridges along the Dutch-German border. Journal of Ethnic and Migration Studies, 31, 323-343. For a significant period of time, I have been wanting to summit Mount Snowdon, the highest peak in Wales. After proposing this to my mother at the beginning of this summer, we decided to book a hostel room and attempt the walk, which is hardly challenging for experienced walkers and takes around 5 hours to ascend and descend. My family enthusiastically seeks naturally beautiful landscapes, which exist in abundance in rural Wales; I also sought the sense of achievement which reaching the top of a mountain brings, and ideally the stunning views which were sure to accompany this. However, thinking deeper into geographical understandings of how nature and landscapes are interpreted, I have come to realise that perhaps my experience of Snowdon cannot simply be boiled down to one of beauty. 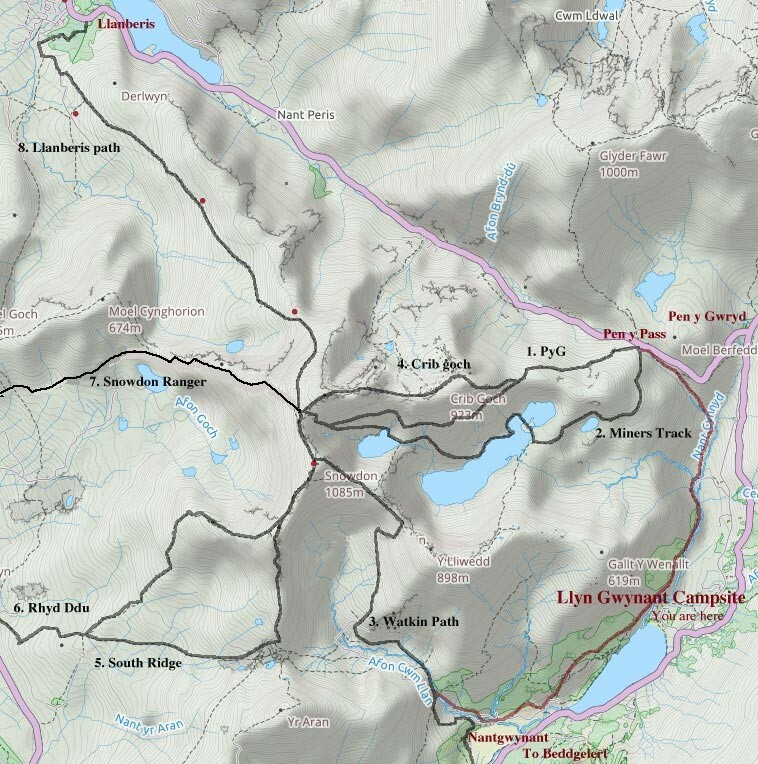 My walking party chose the manageable Snowdon Ranger path, which coincides with the popular Llanberis path shortly prior to reaching the summit at 1,085m. Despite a reasonably quiet walk up, in which our encounters with other walkers were only occasional, on joining the Llanberis path this changed drastically. The summit of Snowdon was very busy, a fact that was only augmented by a horde of runners competing in an international hill running race that day. My search for undisturbed and beautiful nature had been interrupted by excessive human presence, which begs the question: is nature really natural? In common conceptions of nature, a false dichotomy can be observed between nature and society, such that nature is pristine, God-given and unmarred, the raw material exploited by ‘society’ for the purposes of production (Smith, 2010 in Apostolopoulou, 2016). Nature is therefore defined by a dualism which is inapplicable to reality, as my visit to Snowdon suggests: seeking ‘nature’ as a wild, untouched entity is impossible. 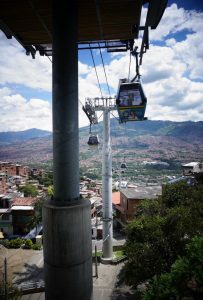 We expect that nature is grounded in a divided geography, islands of ‘natural’ space surrounded by less ‘natural’ urban or inhabited areas, but inevitably nature and society are inextricably intertwined. 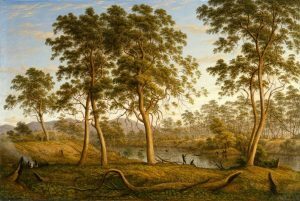 Nature has been defined by its distance from humans, and humans therefore seek wilderness – yet this presents a paradox, because any space in which humans are present fails to conform to what we would label ‘natural’. This was evident in the extreme up Snowdon, where the presence of other walkers rendered the scenery ‘unnatural’. This is a notion much discussed among Marxist geographers, who have investigated and developed Marx’s ideas about the concept of nature writing from the middle of the 19th century. According to Smith (2010 in Apostolopoulou, 2016), Marx suggested that virtually no nature existed any longer which predated human history; simply put, we almost can’t find any piece of nature that hasn’t been influenced by humans. This could be labelled the ‘Anthropocene’, yet this in itself is a problematic term – ‘anthropos’ implies that humans are against the great forces of nature, reinforcing the Cartesian dualism characterising human relations with nature (Moore, 2014 in Apostolopoulou, 2016). 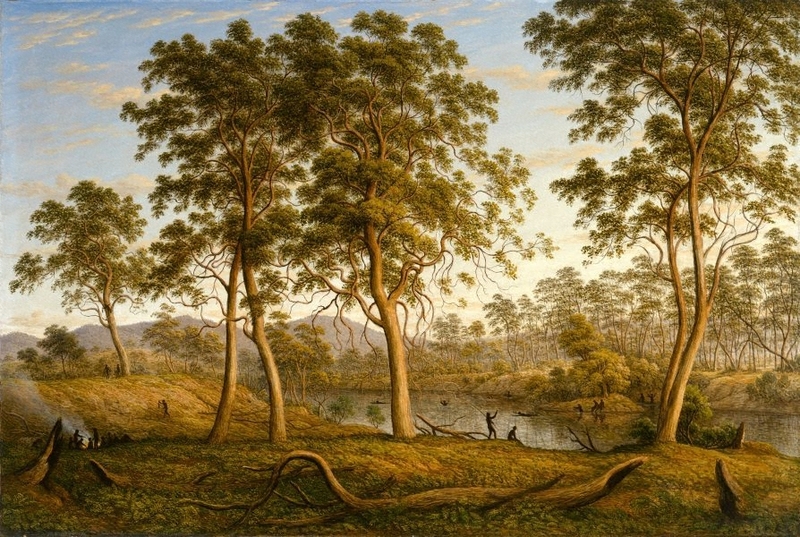 Even the way we address discussions of nature with humans as a central role, for example within debate around contemporary environmental issues or designating Sites of Special Scientific Interest, suggests that nature cannot coexist with society and retain its ‘naturalness’. Furthermore, our conceptions of nature and landscape tend to be limited to outside spaces – yet time spent playing board games in the hostel and looking down the spectacular Pen-y-pass was an equal part of the experience of nature in Snowdonia, as this created a locale in which the mountain was experienced. The ways in which humans experience the landscape are varied: it can even be through representations of the landscape, for example through the maps and pictures lining the walls of the youth hostel. The debate arises as to which provides the most complete picture of the landscape – these maps, including the one pictured, exclude certain aspects of the landscape such as the people who may be encountered on the paths, and how busy they are. Spinney (2006) argues for a phenomenological approach to landscape, where it is experienced pre-cognitively through the senses – the body and the landscape are intertwined through movements, urges, emotions, or routines. Motility is of utmost importance here due to the body’s capabilities to access a new layer of meaning from the landscape through the senses such as temperature monitoring, vision, and kinaesthesia (Spinney, 2006). 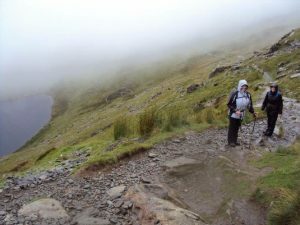 Kinaesthesia was particularly important when ascending Snowdon, due to the thick cloud clinging to the mountainside – like Ingold (2000, in Spinney, 2006), I felt rather than saw the contours of the landscape due to the muscle burn of ascending and the shifting of scree beneath by boots. Overall, looking at my experience of Snowdon through a geographical lens demonstrates how concepts within the discipline of human geography are endlessly applicable even in a setting which many would initially not associate with humans – the wilderness of Snowdon is not, in fact, wild at all, but permeated with human relations. Apostolopoulou, E., (2016) Nature. [Lecture to BA Geography Year 1]. 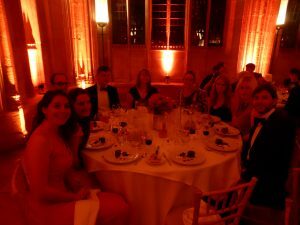 Oxford University, 30th November 2016. Llyn Gwynant Campsite (2017). Walking. [online] Available at: http://gwynant.com/activities/walks/ (Accessed: 1st October 2017). Spinney, J. (2006) A place of sense: a kinaesthetic ethnography of cyclists on Mont Ventoux. Environment and Planning D: Society and Space, 24, 709-732.